Iron Hydraulic Hinge 4 Hole Plate, Hydraulic Hinge, Stainless Steel Dish Rack, Magic Pull Down Cabinet, Innotech Slim Drawer Tandom Box, Stainless Steel Satin Pantry as an active Manufacturer, Supplier, Dealer, Distributor, Trader and Seller etc. (*Importer/Exporter/Service Provider). 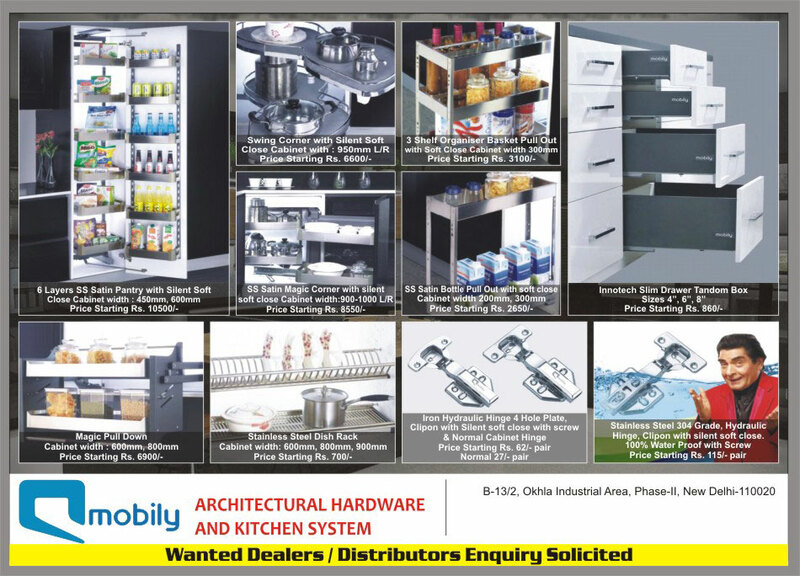 United E Marketing is a distinguished Wholesaler and Trader offering an enormous consignment of Architectural hardware and kitchen system e.g. Iron Hydraulic Hinge 4 Hole Plate, Hydraulic Hinge, Stainless Steel Dish Rack, Magic Pull Down Cabinet, Innotech Slim Drawer Tandom Box, Stainless Steel Satin Pantry etc. Immensely acclaimed in the industry owing to their preciseness, these are presented by us in standard and modified forms to our clients. To add, only optimum class material is utilized in their production. These presented by us in various provisions, these are inspected sternly to retain their optimum quality.We are supported by a team of trained and diligent workforce that is hired from some of the best talents present in the market. Working in synchronization with each other, some of the main members of our crew include quality testing personnel, R and D executives, marketing executives, logistics personnel, packaging personnel and administrative staff. Chosen after stern examinations of their knowledge and skills, these have assisted us in completing bulk orders of our customers in between the assured span of time.